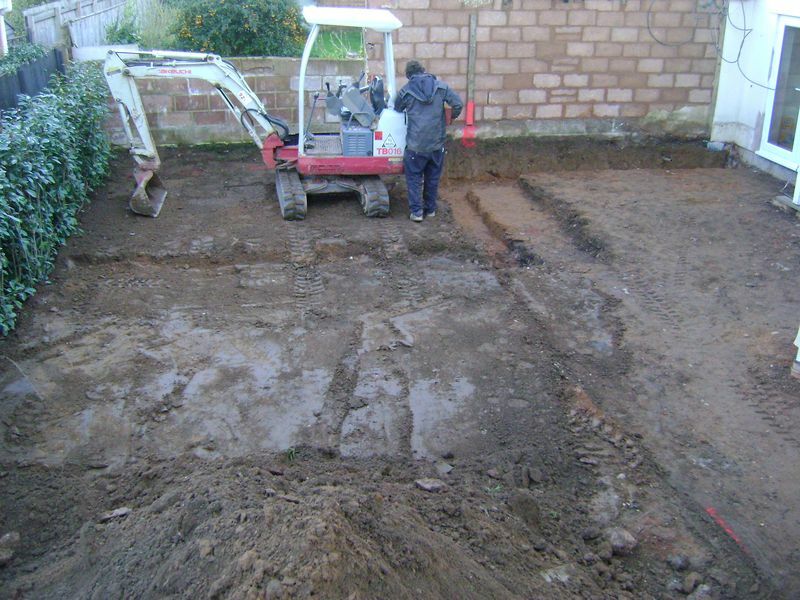 An insight into the daily life of a garden design and landscaping build up on a rear garden located in Exeter, Devon. I requested a larger machine to move the stockpile of rubble as the previously hired excavator struggled to meet the demands of the project. You never can tell what belt of ground lies below the surface topsoil. 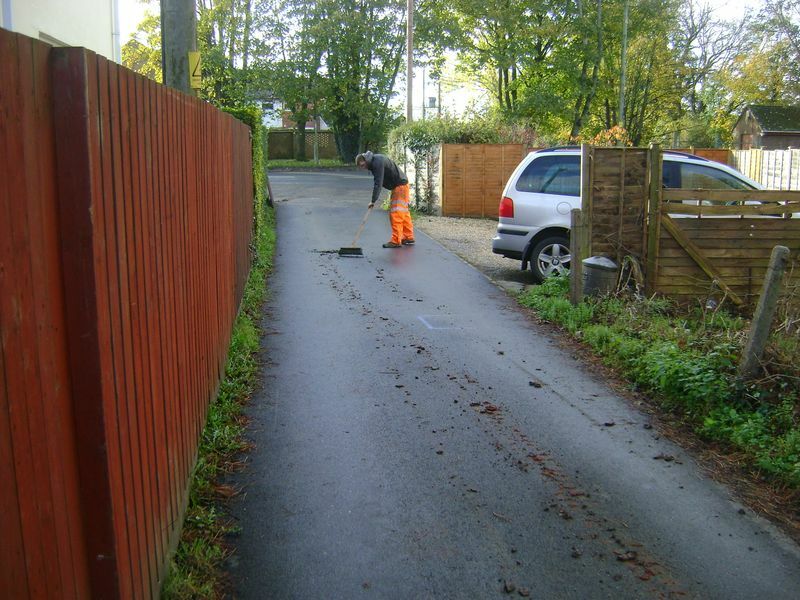 Now that the micro excavator has been replaced with a 1.5 ton machine, the roads are swept clear to eliminate any future problems that may arise from peeved neighbours, this and parking are the two most common problems that have risen in the past….. a long time ago I must say. Again common courtesy goes along way. The excavator has been checked for oil, water and red diesel, the rubble can be moved into reach of the Hiab grab. I set the revs to a touch of high and operate the digger until the pile is relocated. 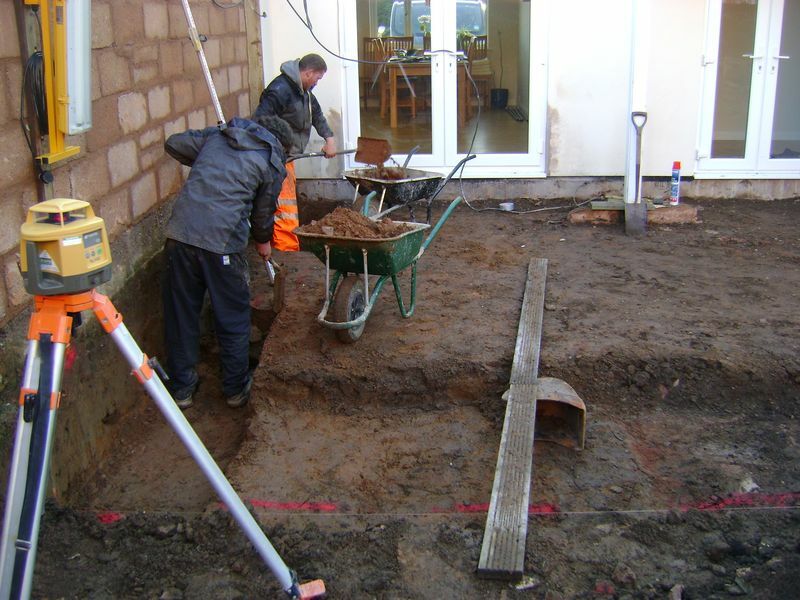 In the mean time the team mark out the retaining wall footings and hand dig to 500mm below finish floor level. As a rule I’m a firm believer of allowing the excavator to do it’s job, however, on this occasion it’s a hand dig as I cant slue round with out fear of knocking this 2m high 100mm wall !! A 2m high x 225 wide feature T shaped 7 newton block wall with recesses and stainless steel up lighters will be constructed on 600mm wide x 500mm deep Rc 35 structural concrete, the team makes short work of this minor hand dig. We’ve hand dug on landscaping projects were goats refuse to venture !! With the ditching bucket I have cut the footings which will accommodate the exterior garden BBQ and kitchen area, the later gas bottle and all electrical ducting, lighting, pump switches will be out of sight in the cupboard space below the work surface. With half of the feature wall footings dug, the decking dig reduced to the correct levels and the days drawing in way to quickly for my liking, I start to cut and reduce the raised seating area, riser and half of the main paving and led reflection pool area by eye. Having an “eye for a level” cannot be bought and takes years of practice to gain…… I wont be far out once the team dip tomorrow with the lasor level. 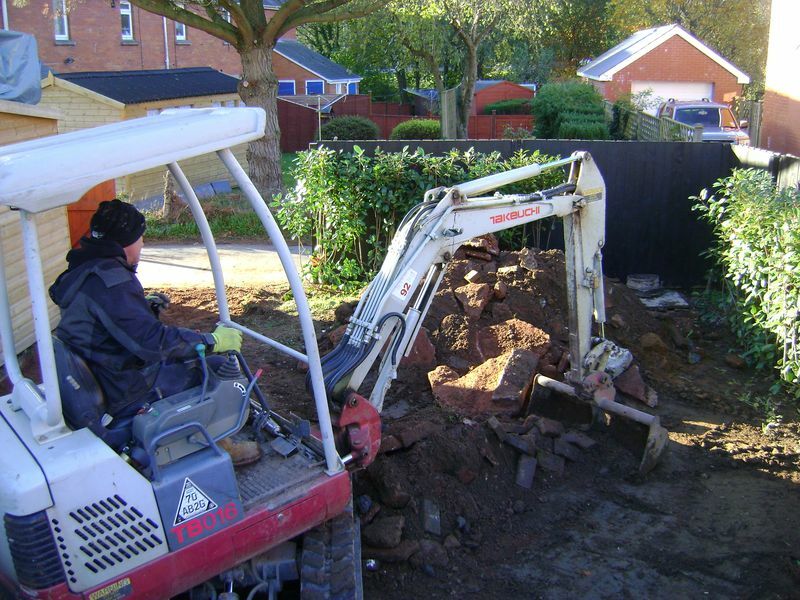 Clean site, secure all tools and diesel the excavator, never diesel up in the mornings as the fuel tank is half full or less and will collect condensation over night.